The Toronto Jazz Festival had termed this evening a Blues Revue. That was a mite misleading, given that it was headlined by veteran U.S. soul/R&B star Bettye LaVette, but it was certainly blues that was delivered by the opening acts. Toronto mainstay Danny Marks was tasked with assembling an A-list of local players and guest singers, and he acquitted himself admirably. The house band comprised guitarists Marks and Chris Whiteley, saxophonist Carrie Chesnutt, bassist Justine Fischer and drummer Shamakah Ali, and the vocalists delivering two songs apiece were Marks, Diana Braithwaite (accompanied by Whiteley on harmonica), Raoul Bhaneja and Crystal Shawanda (joined by husband Dewayne Strobel on guitar). All impressed the audience, with country star Shawanda showing she can belt out the blues with real skill. The entire cast joined in on the finale, a boisterous version of Jimmy Reed's "You Got Me Running." With the death of Sharon Jones and health issues of Aretha Franklin, Bettye LaVette now sits alongside Mavis Staples in the top tier of veteran female soul singers. Her compelling performance here confirmed that status, showing why Verve Records recently signed her. "At 72, I'm likely the oldest artist out performing to get a new record deal," she joked at one point. LaVette is out touring her acclaimed new record, Things Have Changed, an album comprised of fresh takes on Bob Dylan songs. Dressed in a red pantsuit, she opened the show with the title track, prowling the stage with leonine grace while delivering such timely lines as "people are crazy, times are strange." Her set almost exclusively featured her Dylan songs, played in the album's order, and LaVette's famed skills as an interpreter were on vivid display. Versions of "It Ain't Me Babe" and "The Times They Are A Changin'" were almost unrecognisable from the Dylan originals, but were given fresh life. Less familiar material like "Don't Fall Apart On Me Tonight" and the showstopper "Emotionally Yours" ("my favourite song on the record," LaVette told us) showcased Dylan's more vulnerable side, to powerful effect. LaVette joked at one point that "I learned a life lesson making this record. At 72, don't try to learn 12 Bob Dylan songs. All those damn lyrics!" She did actually employ a lyric sheet as a safety net, but only gave it an occasional glance. Her four-piece band (guitar, bass, drums, keyboards) was certainly competent, if a little lacking in charisma. Still, when you're backing a performer as captivating as this one, that's not a big problem. The 90-minute set was well-paced, with the singer by turns sitting down to deliver the ballads, then pacing the stage for the rockier tunes. LaVette is a master of the theatrical gesture, as with the off-mic singing as she departed the stage on the closing number, "Going, Going, Gone." 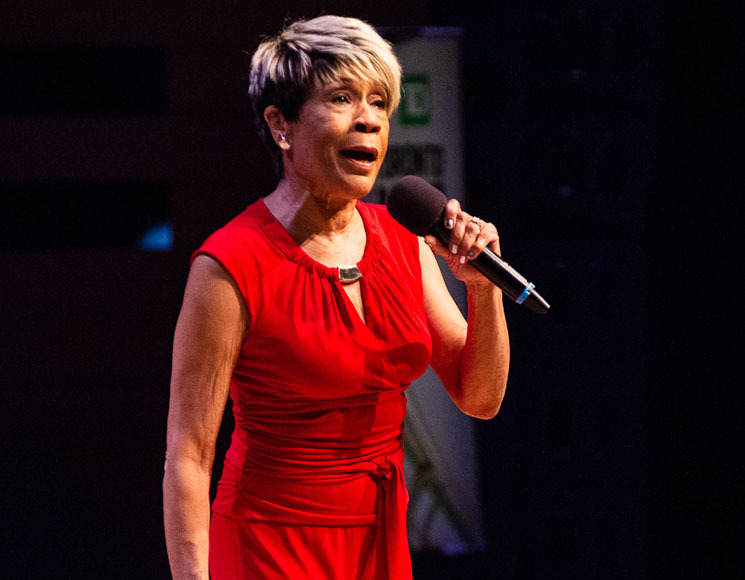 This did, of course, elicit a deserved standing ovation, prompting her to return to deliver one of her strongest original tunes, the autobiographical "Before the Money Came (The Battle of Bettye LaVette)." It includes the lines "40 years I kept on singing, before the money came." As she reminded us earlier, that money is not as much as it should be, but there's no denying the richness of her talent.